After years of searching by Congressional investigators, FBI agents and investigative journalists, the timeline of Hillary Clinton’s email scandal still contained gaps in which the buck could be passed. Paul Combetta, the IT tech from Platte River Networks, was Hillary Clinton’s fall-guy. The Clinton campaign said Mr. Combetta acted alone when he used BleachBit deletion software to permanently destroy 33,000 supposed yoga, recipe and marital communications on Hillary’s private email server, pursuant to a 60-day email retention policy. The data was so ruined that “even God” couldn’t read it. 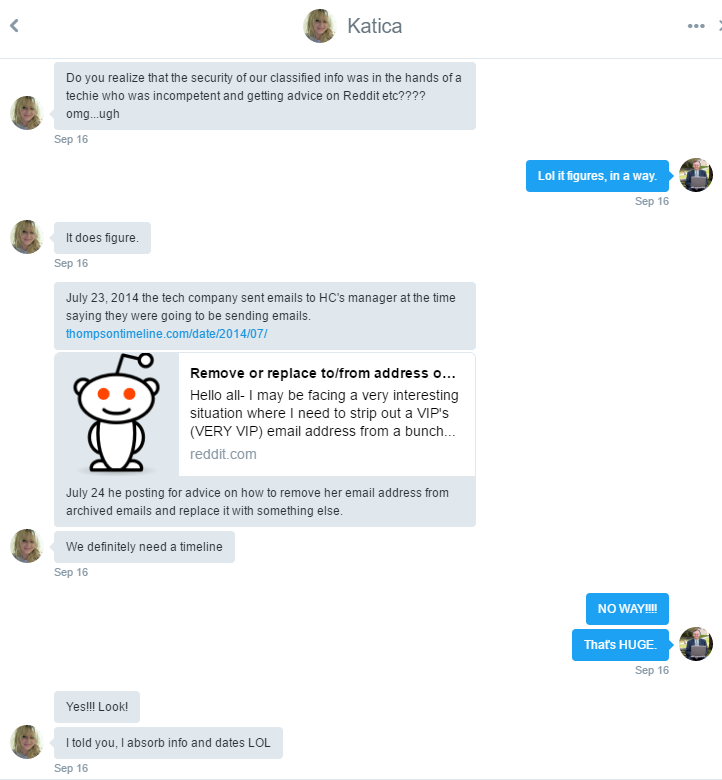 Katica also found a December 10, 2014 Reddit post in which “Stonetear” requested help implementing a 60-day email “purge” policy. Assuming that “Stonetear” was discussing Hillary Clinton’s emails, these finds appear to be the smoking gun in the Clinton email scandal. The posts prove intent to obstruct the production of evidence to Congress, either through deception or deletion, and that these events took place after the evidence was requested. There is no legitimate reason for anyone to act this way if the emails merely contained information about yoga poses and wedding invitations. He owns a house in Rhode Island. His Reddit posts mention living in Rhode Island. He had multiple IT forum entries on Reddit mentioning various tech issues. There was a Facebook photo with a caption saying that one of the men in the photo is “Stonetear,” and Paul Combetta is in the photo. There is a website thanking him for helping with issues with an internet game and including stonetear@gmail.com as his email address. There is a (now deleted) Etsy account where the username is “Stonetear” and the user’s name is Paul Combetta. Considering all of this together, either Paul Combetta is “Stonetear” or he has a lookalike who works in IT, goes by the same username and lives in Rhode Island, which is extremely unlikely. While the social media posts linking “Stonetear” and Combetta were already convincing, the “Stonetear” Reddit posts also fit perfectly into the Clinton email scandal timeline. June 30, 2013: Emails from the server run by Bryan Pagliano were slowly migrated to a PRN server. By December 2013 the emails were being exclusively managed by the PRN server. July 2014: Clinton aide Cheryl Mills arranged for [name withheld by FBI] to export all .gov emails from the PRN server, which he then exported to Mills’ and Clinton lawyer Heather Samuelson’s laptops via ScreenConnect. July 23, 2014: House Select Committee reached an agreement with the State Department for production of Hillary Clinton’s emails. Late September 2014: Mills and Samuelson asked [name withheld by FBI] to export all emails to them, not just those with .gov addresses. The FBI noted that [name withheld by FBI] made “inconsistent statements” over three interviews regarding the location from which he extracted the emails on the server. September to December 2014: Samuelson reviewed Clinton’s emails using keywords and email header information, but did not review the content of each email. December 5, 2014: Clinton provided 55,000 work related emails to the State Department. December 2014: The month Hillary Clinton decided to implement an auto-deletion policy to purge emails older than 60 days, per her FBI interview. December 10, 2014: “Stonetear” asked Reddit users for help formulating a 60-day deletion policy, which involved automatically deleting emails 60 days old for “certain users” unless specifically saved. March 3, 2015: Congressional committee sent a written preservation request to Clinton’s lawyers for Clinton’s emails held on the PRN server. March 4, 2015: Congressional committee issued subpoena to Hillary Clinton for her emails held on PRN server relating to Benghazi events. March 9, 2015: Mills emailed [name withheld by FBI] at PRN and referenced Congress’ preservation request. March 25, 2015: President Clinton’s staff and employees of PRN held a conference call. Sometime between March 25 and 31, 2015: Combetta realized he did not implement a 60-day email purge policy pursuant to Mills’ order in December 2014 and reportedly had an “oh sh*t” moment, after which he used BleachBit software to destroy Hillary Clinton’s emails on the PRN server. Combetta later told the FBI that he knew about Congress’ preservation request when he used the BleachBit program to purge Clinton’s emails. On September 8, 2016, Congress discovered that Combetta was granted immunity by the Department of Justice in relation to information he provided to the FBI in its investigation into the Clinton email server. On September 13, 2016, Combetta appeared before a Congressional oversight committee and invoked the Fifth Amendment privilege against self-incrimination, refusing to testify. We don’t know the scope of the DOJ’s immunity order because neither the FBI nor the DOJ told Congress it even exists, and Combetta did not bring it with him to the September 13, 2016 hearing. However, if the immunity order applies to Congressional hearings and these facts, Combetta may be forced to testify in a future hearing. After a lot of discussion about the potential fallout of this decision, Katica and I decided the “Stonetear” information had to be released. Late Sunday night, we tweeted the (then-live) short link to the Reddit “VERY VIP” post and four screenshots to Katica’s 2,000 followers, followed by an immediate retweet of her post to my 16,000 followers. The response was immediate. We stayed on the phone to monitor the uptick in retweets together, as well as to read and respond to the tech people who went onto Reddit and archived “Stonetear’s” posts (something neither of us non-techies even considered doing at the time). The Redditors also gave us input on the IT details contained in the Reddit posts and hunted down even more social media connections between “Stonetear” and Paul Combetta. After a nearly sleepless night, the next morning we direct messaged and/or posted on as many threads of influential Twitter accountholders, reporters and members of Congress as possible. The story broke shortly afterwards on several conservative websites, such as Conservative Treehouse and the Daily Caller. “Stonetear” started deleting his Reddit posts within a few hours of the stories breaking, which was caught on video while it was happening and posted on YouTube. Later in the day, the story made it into US News and World Report, the first mainstream media outlet to cover the story, followed the next day by The Washington Post. By Tuesday, a congressional committee demanded Combetta submit to recorded interviews by this Friday or threatened to issue a subpoena. All of this was caused by the amazing sleuthing of a student majoring in eDiscovery and litigation, then promoted by a Twitter parody account, then expanded upon and disseminated by an army of Reddit users. Nothing can be weirder than this election, but I hope this article proves that this revelation didn’t involve a “conspiracy” between Putin and Trump—it was simply the crowdsourced efforts of people who are sick and tired of Hillary Clinton’s corruption and cover-ups.